Not Now...I'm Reading! 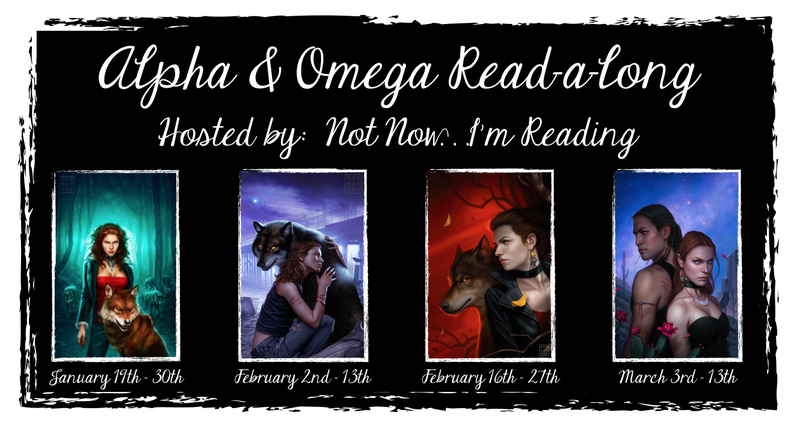 : The Alpha & Omega Read-a-long is FINALLY here! ♥ Read-a-long starts on January 19th. We'll have two weeks to read each book. A discussion post will go up according to the schedule listed below (probably on Mondays). ♥ Anyone can participant. The rule of thumb is usually the more the merrier. ♥ Should a Twitter chat ensue (and I totally hope it does) use #AOReadalong so other read-a-long-ers can find you/join the chat. ♥ If you have any questions or concerns, don't hesitate to contact me. ♥ The most important thing is to have fun! Enjoy Charles and Anna's journey. Don't stress out! If you can keep up, great. If you can't, not a big deal. There's plenty of time to sign up. Look forward to reading and chatting with you! Have fun guys! I'll check in with you next Monday to see how you're doing. Want to talk before then? Hit me up on the Twitter at @NotNotImReading.